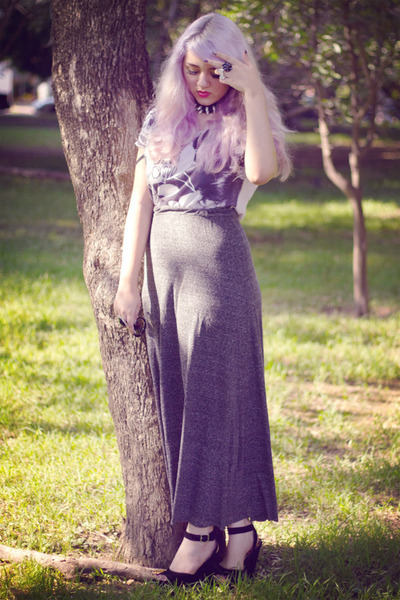 Wearing my t-shirt with my gray long skirt and black platforms=so comfy! Sorry for not posting lately, hopefully i’ll take more photos of my outfits to share this month. Love the color and texture of the skirt. Shoes are sooo gorgeous! your hair is fantastic! im only brave enough for a streak of lavender in my hair! you look so beautiful!! your hair is the most amazing thing!! perfect top and chic maxi skirt!! faved dear!! i LOVE your lavender hair! really works with this outfit too. great style and lovely photos. Your hair looks lovely! Very pretty outfit, I love how those color look so good together! Soft colors look great on you too! Beautiful shoes! Chic voted! thank you so much <3!!! Love the lavender hair !